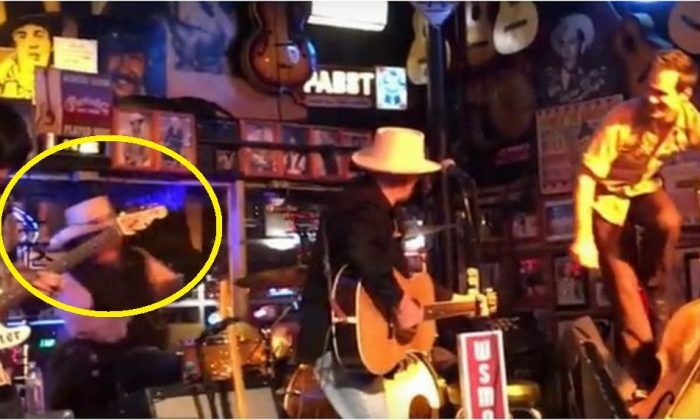 A drummer with a Nashville country band fell through a window at Robert’s Western World over the weekend, and it was captured on video. Stan Saxon, with legendary honky tonk group the Don Kelley Band, fell from the front window at the venue. He flipped backwards while the band played “Ghost Riders in the Sky” and broke through the front plate glass window before landing on the sidewalk. The incident was first reported on blog Saving Country Music, which caught it on video. “My ear monitor pulled me back, felt like somebody grabbed me by the shirt and yanked me to the ground. It was like the window wasn’t even there. The next thing I knew I was looking up at shards of glass going, ‘How did I get out here? '” Saxton told News 2, describing what happened. It was like the window wasn’t even there. Saxon, according to the Tennessean, is reportedly fine. He got back up and started playing again. The window was boarded up and the Don Kelley Band will play again on Saturday evening.